Summer is, apparently, the worst time to buy a cabriolet – with the sun blazing and the roads dry, it quickly becomes a seller’s market, with prices hiked up to reflect the weather. But that doesn’t mean you don’t want to dash out to the local forecourt and pick up a warm-weather soft-top, so here’s a roundup of some of the most popular, with a guide to what you should be paying based on our pricing section. The TT Roadster line up is pretty broad, ranging from the entry level 1.8 petrol to the extremely quick TTRS, but for something with a good balance of performance, value and economy the 2.0 TFSI petrol is a good choice. According to our pricing section, 2008 models are usually listed for between £15,120 and £17,370, and you should expect to pay £15,540 for a decent example at an independent dealer. The current incarnation of the MX-5 has been around for quite some time now, but that doesn’t mean it’s anything other than great fun to drive. It’s not particularly powerful, but with its balanced weight distribution it’s the ideal car for spirited summer evening drives. Prices aren’t too steep, either. Most 2008 models are listed at between £8,500 and £9,000, and you should be paying just shy of £9000 at an independent dealer - or less from a private seller. 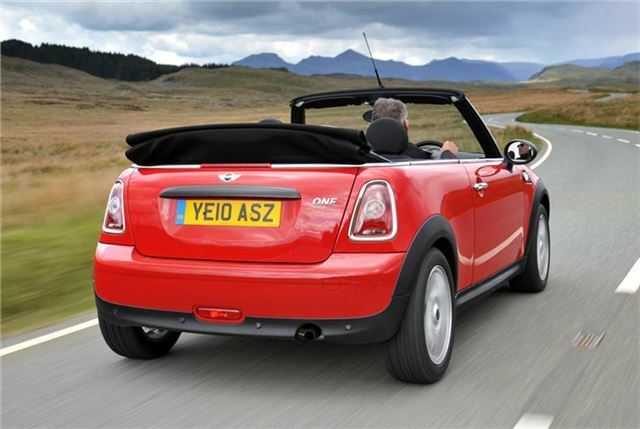 The MINI has a well deserved reputation for being fun to drive, and even with the convertible it remains the case – chopping the roof off hasn’t dulled the handling or the pointy steering. The 211PS JCW model is probably more than most buyers will need, so look for a Cooper S.
2008 MINI Convertible Cooper S models tend to be priced at between £10,000 and £11,500, but if you buy from a private seller you might clinch a deal for less than £10,000. Rather than being outright fun, the E-Class Cabriolet is a refined, comfortable cruiser, which is quiet with the roof up or down. Best with an automatic gearbox, the E-Class Cabriolet is suited to long distance journeys, and the roof can be raised or lowered on the go – handy if you run into adverse weather. The current generation E-Class Cabriolet has only been around since 2010, so prices are still high. You can get a 2010 E220 CDI automatic for between £31,000 and £35,000. Expect to pay £31,400 at an independent dealer. The 206 CC introduced folding metal hardtops to the mainstream market, and it was a very popular car. Its replacement, the 207 CC, offers more of the same, but with improved build quality and more efficient engines. Because of its popularity there are plenty of 207 CCs around, so you shouldn’t have any trouble finding one nearby. Go for a 2008 GT model with the enjoyable THP petrol engine and you should expect to pay between £8000 and £9000 at a dealer – but there are plenty available for less from private sellers. Whether you’re interested in a convertible, a coupe or just a regular everyday hatchback, you’ll find pricing guidance here, and a selection of used and new car listings here.